PLEASANTVILLE, N.Y. -- It's not a typical spring break trip when you get the chance to experience firsthand the remnants of the Cold War in the West. However, during last year's semester recess, a group of film production students from Pace University were given the opportunity of a lifetime: travel to Cuba during former President Barack Obama's historic visit and chronicle the country's remarkable transformation. The capstone of Pace's Producing the Documentary course, a class offered to undergraduates each spring, "Cuba's Crossroads: Hope, Rock, and [R]Evolution," is the program's most recent student production. "This course has taken students everywhere from Portugal, to learn about cork production, to Belize, where we interviewed women shrimp farmers," said Dr. Maria Luskay, the course's professor and trip organizer. "Once I found out that Cuba was opened for tourism, I knew we had to go." Getting into Havana and traveling the rural nation last March wasn't easy, due in part to the language barrier and bureaucratic red tape, but also because of President Obama and The Rolling Stones' unplanned visits. Once there, however, the students got behind the camera and began capturing daily life in a the oft-misunderstood nation. "Talking to people, we found that many wanted to have the same modern lives we have," said Danielle Garnes, a senior at Pace. "It was interesting to see them go to internet hotspots and check their emails just like us." For other students, the island's openness came as a shock. "The biggest surprise was the hospitality of the people," said senior Nick Ostrander. "You hear about the dictatorship and the harsh police, but everyone was warm and welcoming." Andre Infante, a Pace junior and native of Costa Rica, noted that unlike other parts of Latin America, Cuba felt secure, especially at night. "I didn’t feel endangered, I felt safe," he said. After filming for a week, the students returned to Pleasantville and began unpacking their footage, one frame at a time. "When we got back, we analyzed the footage and had to pick out the story," said Joe Gonzalez, a junior. "We found that in all the footage, the Cuban people were clearly going through this evolution. The island was at this crossroad, moving from a non-American lifestyle to an American one." With the topic set, students spent the next seven weeks watching, editing and splicing, working to turn their raw footage into a story. The final product is remarkable. The documentary shows a nation of paradox; it tells the story of a gregarious and inviting people suffering from a crippling isolation. The history of Cuba and the Cubans dances across the screen, shown in stunning beauty. With their completed product, the students entered the film in several independent awards competitions, ultimately winning the internationally-judged Spotlight Documentary Film Awards . "We’ve never won this award, so that is a big deal," said Luskay. "It’s not a genre specific award, so it really ran the gamut to win." The documentary was also recently nominated to the Best Shorts Competition , and the accolades continue to flow. On the first day of class, Luskay had a warning for the 15 students involved: this project won't be easy. "I told them they had to work their tails off, and they did," she said. For the young filmmakers, the class offered not only a once-in-a-lifetime trip, but also provided important hands on learning in the film industry. "The class helped me understand the process of making a concept and an idea into a final project," said Gonzalez. "The skills I learned through this project have made me want to continue on and find success in the film world." 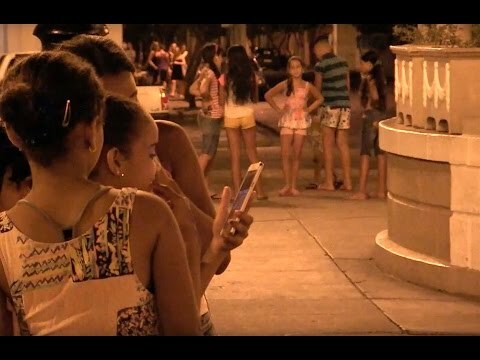 Watch "Cuba's Crossroads: Hope, Rock, and [R]Evolution" in the video above. For previous Daily Voice coverage of the trip, click here.